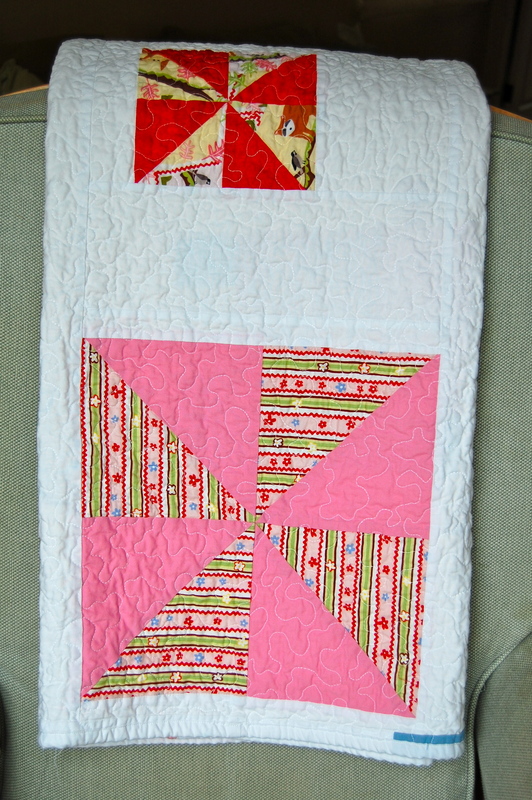 The birthday quilt that I talked stressed about here and here, was officially finished on the weekend of Miss N’s birthday! To say I was determined would be putting it mildly. 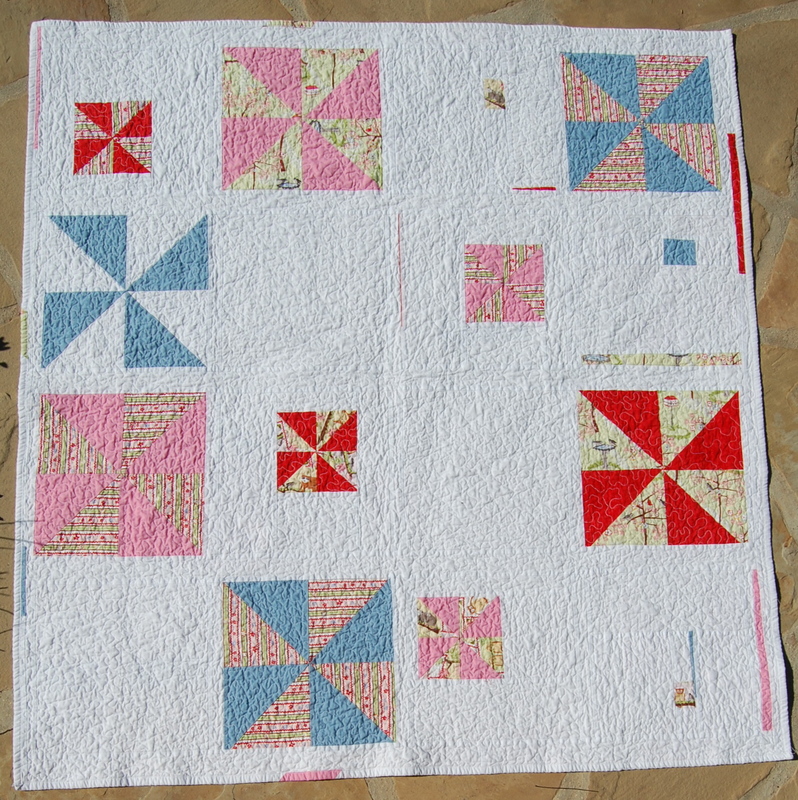 After the closest thing to an all-nighter I’ve pulled in a long time and an entire Sunday morning dedicated to quilting/binding, it was a done deal. I was able to present it to her. After she had seen the entire process, the “big unveiling” I admit, was rather anticlimactic. “Here’s your special birthday quilt Sweetie” –short pause, into- “Mamma, look what I can do.” She then proceeds to show me her new “trick” of jumping off the couch. I guess all nighters and months of work and pondering don’t really mean a lot to a three year old**long, deep, sigh**. Ha, it’s all good!! 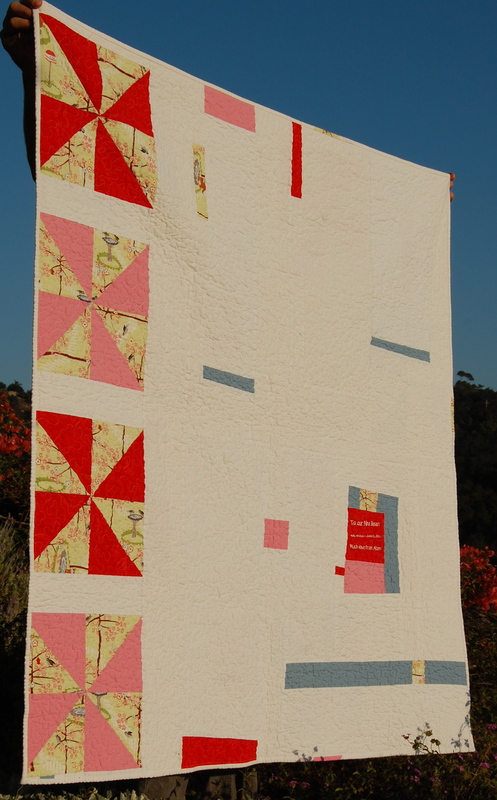 I love the quilt and I know she will grow to appreciate it in time. 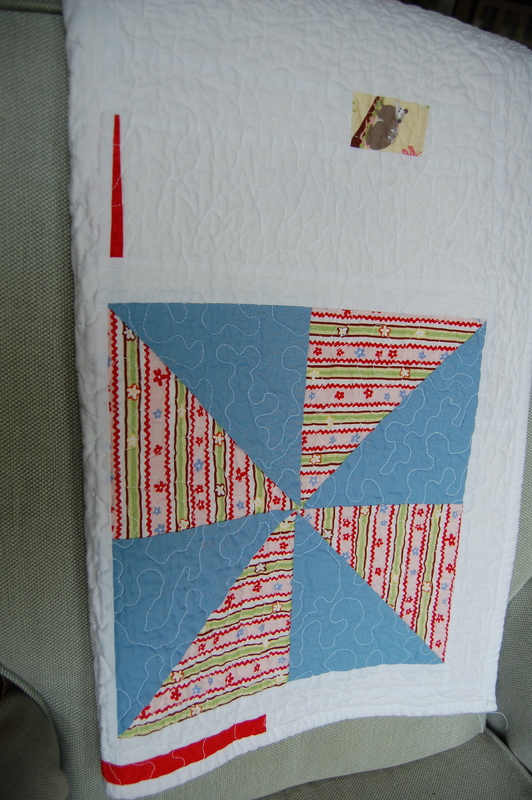 I’m getting pretty good with my embroidery unit on my Bernina and was able to piece in a nice label for the back. These outside photos turned out a bit yellow–hhhmm?? 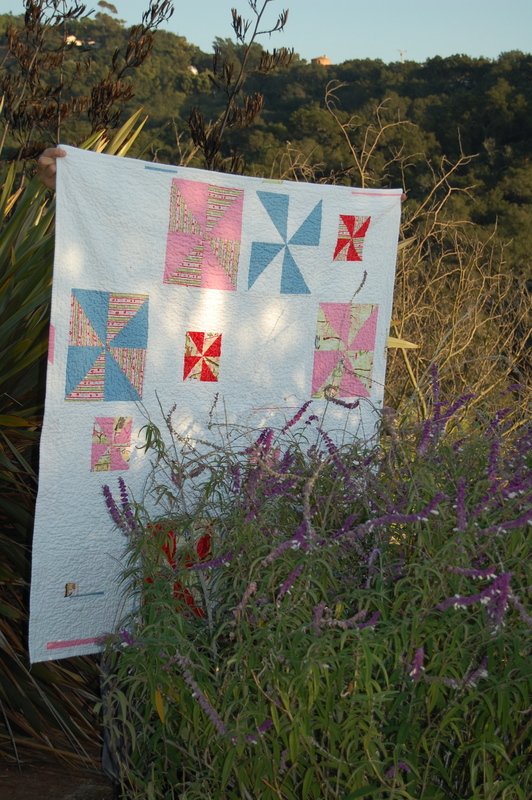 Anyway, this quilt was really fun to create…..
and the best part is that she can now start enjoying it. This is her first post-nap snuggle with it, and her big sis (along with my “What’s for Breakfast” quilt on the back of the couch. Thanks Wendy!! we missed you last night!!! I’m still amazed at how you manage to carve out the time to create one masterpiece after another. 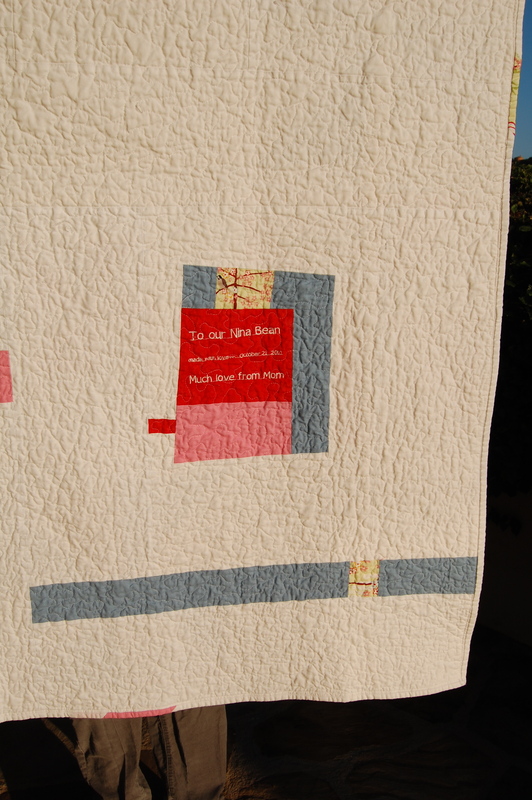 First three gorgeous girls and now truly eye-catching, inspiring, artistic quilts. You go Mama! Thanks for your support Liz. You are always so pleasant and positive!! Nice to see you last night at meeting. I had the same experience with my 6 year old when I gave him his birthday quilt last year. Now he cuddles on the couch with it daily. Love it! I had to laugh out loud at the reaction though … been there. 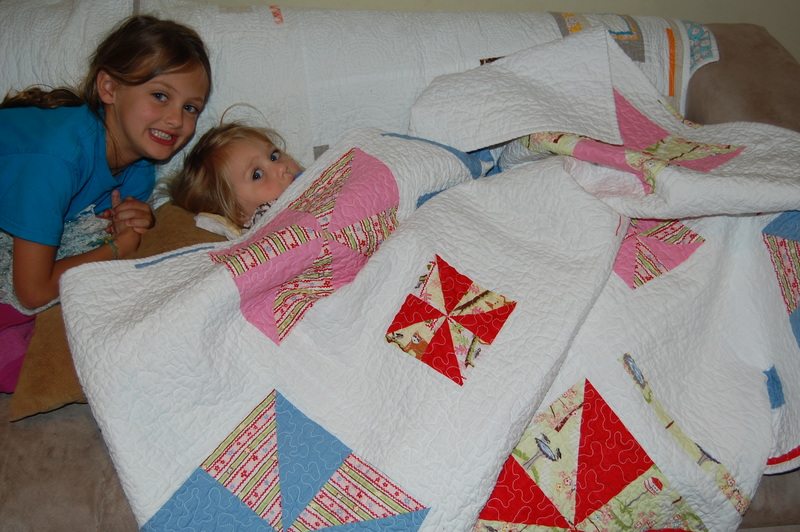 My boys all love their quilts and despite any initial blase … they snuggle with them all the time. those little fabric slivers you use just slay me.